The unfinished crawlspace is rarely an appealing place to visit. These dark, cramped spaces are often inhabited by various species of rodent, an arsenal of poisonous insects, and not to mention the numerous airborne hazards as a result of mold, dust and feces/urine buildup. To complicate matters, it is often poorly designed making it hard to access and easily forgotten. It’s no wonder most homeowners delay treatment and inspection. For better or worse, the crawlspace is part of many home designs and does require attention to help reduce common issues that can plague the crawlspace. In this article, we’ll review some basic facts about the crawlspace and provide proven techniques to help treat and prevent these problems. First, What is a Crawlspace? The crawlspace is a shallow area beneath the home constructed for the purpose of creating a foundation between the ground and the bottom of the home. Depending on your region, the crawlspace can offer many advantages over the traditional basement. Some crawlspaces may have been built to save on cost or to help prevent infestations in termite prone areas. Some say an additional advantage is the ease of accessibility when accessing pipes, plumbing, electrical and HVAC systems. That being said, the crawlspace can also dish out a host of disadvantages for the home. This leads us to one of the most common and yet avoidable problems in the crawlspace - mold and structural rot, due to poor moisture management. Why so prone to mold? Several species of mold growing in a ventilated crawlspace. Mold is a type of fungi that scientifically, is neither plant nor animal. Unlike plants, mold is lacking chlorophyll and cannot derive energy from the sun. Therefore, mold is an opportunistic organism, routinely dispatching its spores through the air, always seeking a habitable environment for reproduction and growth. Once it has located the few requirements it needs to thrive - water, food source, and warm temperatures, mold can begin to grow remarkably fast, sometimes within 24-48 hours. Originally, building code required the crawlspace to be ventilated to use outside air as the main source of moisture control. The theory was to allow an outlet for excess moisture to evaporate. Unfortunately, in some areas of the country (especially the southeast), ventilation can actually make a mold problem much worse. This is because the air inside the crawlspace tends to be much cooler than the outside air. In warmer months, this becomes problematic due to the fact that warmer air is constantly flowing into the ventilated crawlspace. Basic science tells us that when warm moist air comes in contact with cooler air, the warm air cools, releasing moisture in the form of condensation. This continuous source of moisture, humid temperatures, and a steady food source (the building materials in your home), creates the perfect environment for mold/mildew to flourish. 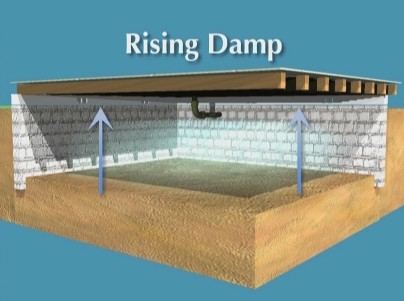 Rising damp is basically moisture moving from the ground, traveling upward. This can be a major problem for a crawlspace that has not been encapsulated and protected with a vapor barrier. This natural flow of moisture can begin to effect the subfloor, beams and foundation allowing water to rise through the foundation and eventually into your home. Additionally, the habitually wet environment encourages many types of wood-decaying fungus. If left untreated, this fungus will gradually rot and destroy the material on which it is feeding, eventually leading to sagging floors, structural damage or eventual collapse. Even the encapsulated or “closed” crawlspace can be affected by penetrating damp. This is simply moisture that has made its way into your crawlspace from another source including plumbing leaks, walls, even from mechanical or HVAC failures within or above the crawlspace. Unfortunately, a large majority of homeowners are unaware of the potential hazards to health and home when living with an unfinished crawlspace. Over 60% of your crawlspace air flows throughout your home so a seemingly isolated mold issue in the crawlspace can compromise your indoor air quality and begin to affect your health. 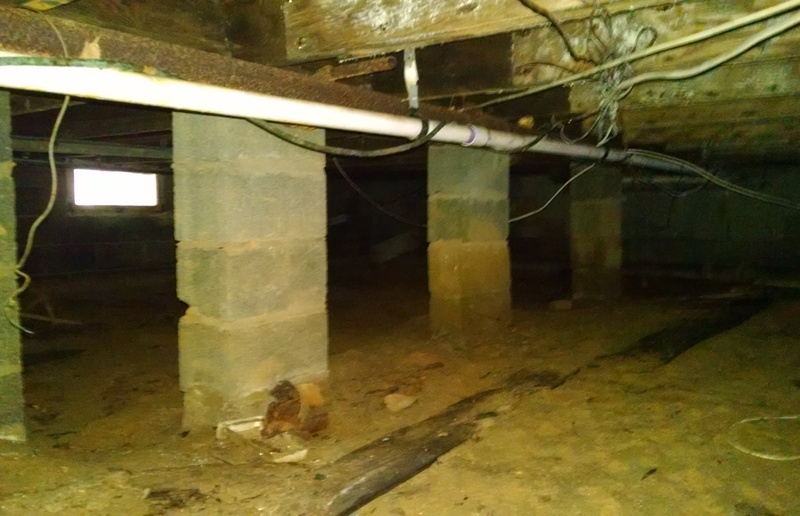 For early detection of crawlspace mold, it is imperative to know what signs to look for. Any signs of water stains or green/pink/black spots showing up around the baseboards are a clear indication of a moisture intrusion. 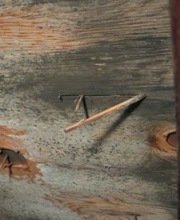 Another sign of mold/fungi is the deterioration of the home structure itself. As previously mentioned, warped saggy floors, bubbling wallpaper, and a moldy smell that just won’t go away are all warning signs of a hidden mold concern. 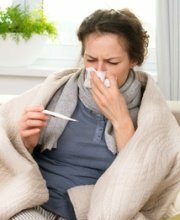 Many people living in a mold contaminated environment have reported numerous, unexplained illnesses when exposed to their dwelling. Symptoms include, a persistent cough, runny, itchy eyes, unexplained respiratory illness, pneumonia and developing asthma in otherwise healthy individuals. If you are exhibiting similar ailments and suspect mold as the culprit, the crawlspace may be the source of the problem. Mold can grow virtually anywhere as long as moisture is present. Therefore, the key to controlling the mold, is to control the moisture. There are many differing opinions on the proper methods to completely eliminate the occurrence of moisture intrusion in the crawlspace. For this article, I’ve included the long time, trusted advice of Mr. Paul Hardy (The Pest Control Expert), a pioneer in crawlspace restoration with over 50 years of experience. The following steps should be taken to waterproof your crawlspace and help prevent complications from excessive moisture. 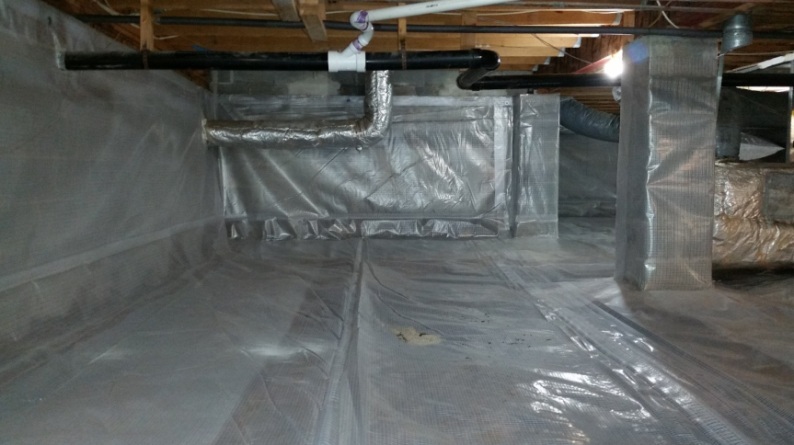 A properly encapsulated crawlspace can ensure long-lasting protection against moisture intrusion. First, you will want to determine how much room your crawlspace will allow you to work. Some crawlspaces are designed extremely tight and do not allow for much wiggle room. Try to do as much prep work as possible outside the crawlspace to help avoid awkward working conditions down below. When you do return to the crawlspace, always remember to wear Personal Protective Equipment such as, gloves, safety glasses and a dust mask. Before you begin the encapsulation process, now is probably a good time to address any structural issues, loose wires or leaky pipes. You’ll also want to look for areas where water may have accumulated or is visible under the foundation. If needed, install a sump pump to remove any excess or standing water. After the crawlspace has dried, it must be cleaned out. If the area has been used for storage, all items should be removed including any garbage and animals/insects. Once it is clean, you will now be able to level the ground. If mold has begun to colonize, it will need to be removed. This does not mean disinfecting it and moving on. Mold must be removed from a porous surface or it will come back. Using an oxygen-based cleaner is your best bet to properly remove the mold from the substrate. Treat all surfaces (including the subfloor, foundation walls etc.) even if you don’t see mold. This will ensure that all hidden mold is properly treated. Rinse as needed and let dry. 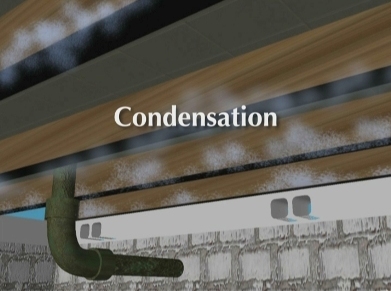 Once the crawlspace is clean and dry, it needs to be protected from future moisture intrusion. The understructure should now be treated with a Moisture Barrier (UltraBan-PRO), plus a Termite Control Product (Bora-care). DO NOT SKIP THIS STEP! Most homeowners don’t realize that mold is often accompanied by termites. Why? Because they both thrive in a moist environment! The UltraBan-PRO/Bora-care combination will provide your home with long-lasting protection from both costly enemies and prevent the need for routine mold removal. The entire understructure should be treated, including foundation walls and supports. Once again, let the product dry and you are ready to move on. 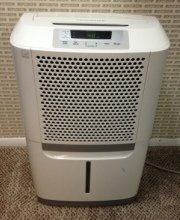 Finally, depending on your region, you may want to install an industrial dehumidifier with a sump pump. This will help with any additional moisture condensation. The crawlspace may be dirty, cramped and infested with all manner of critters but the potential risks to health and home are no laughing matter. If you do suspect a mold issue in your crawlspace, don’t hesitate to act. Contact a certified inspector and do your research. You can follow this link for a list of certified mold inspectors in your area. By treating a mold/moisture problem before it occurs, you can save yourself a world of frustration in the future. This page was provided by Rhino Hide Products. Rhino Hide manufacturers an exclusive brand of non-toxic mold removal and mold prevention products. To learn more about their products and why we recommend them, follow this link to the Rhino Hide Website.